At Brady's we take pride in all the products we sell, especially our beef. 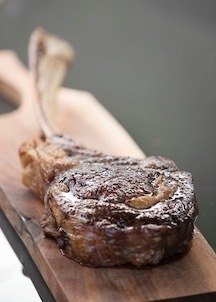 Every primal cut we sell is aged for at least 28 days for optimal flavour and tenderness. Top Sirloin steaks or roasts (marinated, or plain). Our best-selling steak is our Marinated Top Sirloin steak, drizzled with our own special blend of spices and a hint of pepper. Looking for hard-to-find beef products like oxtails or beef liver? We can order it for you on short notice! We are proud to be an authorized retailer of Certified Angus Beef! Certified Angus Beef is the best of the best AAA-grade beef, specifically chosen for it's marbling, texture, size, appearance, and tenderness. Florence Meats in Oakville, Ontario specializes in South African cuts which are hard to find elsewhere. Norpac beef, processed in Norwich, Ontario (a small town about 15 minutes south of Woodstock), is free from antibiotics, growth hormones and the animals have a 100% vegetarian diet and low-stress living conditions, so the meat is tender, lean and high-quality. All of the cattle come from and are raised on small, family-owned Ontario farms. Prince Edward Island Certified Beef comes to us fresh each week from family farms in Canada's smallest province, Prince Edward Island. The cattle at the P.E.I. Certified Beef farms are raised in a traditional way, eating a natural diet of grass, clover silage, hay, and potatoes (P.E.I. is famous for it's potatoes). As a result, the beef is very rich in flavour and is well-marbled. Brady's is proud to be one of the first butcher shops in Canada to take part in the Certified Island Beef program! By popular demand, Brady's now sells natural Wagyū beef from Oakleigh Ranch / Green Pasture Meat Co. in Australia. The breeds of cattle that produce Wagyū beef are specially chosen for the marbling of the meat, which produces a unique taste discovered in Japan long ago (Wagyū, or 和牛, literally means "Japanese cow"). The most well-known of the Wagyū breeds is Kobe, which has become synonymous with Wagyū in the West. We don't bring in Wagyū beef all the time, but we would be happy to give you a call when we bring some in! Just leave your name and phone number with us, and we'll let you know when we have some on order. Natural beef is completely free from growth hormones and anti-biotics. We are proud to carry the product line from Atlantic Signature Beef from P.E.I. and Norpac Beef from Norwich, Ontario. We have all the cuts available fresh weekly. Try our now-famous steak! Baseball steaks are made from the centre cut of the Certified Angus top sirloin steak; aged for over 28 days for maximum tenderness. They're available in 6oz, 8oz, and 12oz sizes. Biltong is a South African variety of seasoned, air-dried beef; similar to beef jerky. We carry both whole and shredded biltong from Florence Meats of Oakville. Boerewors is a South African beef sausage with special spices. We occasionally make our own fresh boerewors, but always carry frozen boerewors from Florence Meats of Oakville. At Brady's, we believe the bread should be around the burger, not in it. Our Beef Burgers come in 8oz patties of pure Natural beef. They are seasoned, and contain no fillers or binders; just fresh Ontario beef from Norpac. Call about our very own dry-aged beef. It's not always available, but when it is, it sure is worth the wait! Most beef that you get in the supermarket has not been aged at all. But, chefs and foodies know that aged beef tastes much better — it has more flavour and melts in your mouth. A newer technique for aging beef, called wet-aging, involves vacuum-sealing the meat. The traditional way of aging beef, however, is to hang it until it is cut (dry-aging). We are proud to carry Sikorski's Montreal smoked beef in our Deli section. We recommend you try it on a sandwhich! The original Brady's steak — tender Certified Angus top sirloin, lightly coated in our black-pepper marinade. You can cook it in the oven, but it's best on the barbecue!